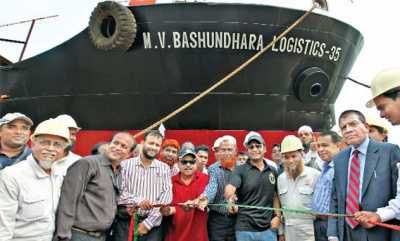 Bashundhara Group broke new ground in its industrial venture as the leading business conglomerate of the country Monday floated a ship of its own make, styled ‘Bashundhara Logistics-35’, in the river Buriganga. Bashundhara Steel and Engineering Limited (BSEL) has made the ship at a cost of Tk 100 million and the vessel will be used for carrying cement clinkers. Bashundhara Group (BG) Managing Director (MD) Sayem Sobhan inaugurated the ship, having carrying capacity of 2,500 metric tonnes of cargoes. Among others, Chief advisor to the Chairman of Bashundhara Group Mahaboob Morshed Hassan, BG Senior MD Belayet Hossain, Lt Col (retd) Khandaker Abdul Wahed, Advisor (Press and Media) Mohammad Abu Tayeb, Senior Executive Director of Bashundhara Steel and Engineering Limited (BSEL) Capt Mohd Ruhul Amin and BSEL Head of Division Capt (retd) SM Shah Alam were present at the inaugural ceremony. Apart from other business sectors, the Group engaged in shipbuilding business in 2002 through BSEL. The BSEL secured a strong position in shipbuilding business of the country keeping pace with the developed countries. It has started its journey by building lighter ship to carry sand. The BSEL has already built 34 sand carrying ships and 13 dredgers with its own technology and logistic support. The Bashundhara Logistics-35 has got certificate from Royal Italiano Navelo (RINA), an Italy-based international ship classification and certification authority, to move into the sea across the world. After the inaugural ceremony, Mohammad Abu Tayeb told journalists that the 72.81 metre long and 13.5 metre width ship which was built after 20 months’ effort can move into any area of sea as it has got RINA certification. “The Bashundhara Logistics-35 ship has been floated as one of the BSEL’s 14 under- construction ships,” he said. Mentioning the extraordinary quality of products made by Bashundhara Group, he said the ships are made with extra care and high technology and cheaper compared to other companies.